Looks like the system will cross just South of Cairns, GFS has the focus of the heaviest falls around Townsville though. We just cant win a trick. Low is way toofar north. NTC will get pounded we will be lucky to get moderate falls. Our flow still ese and drying up as rain moves over ranges. Only hope is flow changes. Bowen has ene. Hopefully we get that. 13mm in the Nylex this morning brings my December rainfall total to 18mm. Only 20C when I got up and Mrs Next door is in a hoodie having her first durrie of the day. Nice steady rain, a lot cooler than it has been as well. Lovely. I am with you there on that one. Nice weather at the moment Townsville. well hopefully ex owen comes back as the models suggest and bring us something. GFS has it as 993hPa over woodstock next saturday. EC right over us at 991hPa. Problem is it will be moving very quickly. So an unstable week ahead, showers storm etc, hopefully some gales and few hours of heavy rain from ex owen next weekend then on the northern side of the system we are back to fine and dry. Nice flow coming in from the East this morning as well, should continue to be good for a few showers through the day. 63mm to 7:00am in BG. Not bad RD! This forum is awfully quiet even with decent rainfall. Hopefully things liven up next weekend if everything goes to plan with Owen. Issued at 10:22 am Tuesday, 11 December 2018. Weather Situation:Thunderstorms are training along numerous convergent zones, particularly around the Daintree and Ingham. Severe thunderstorms are likely to produce heavy rainfall that may lead to flash flooding in the warning area over the next several hours. Locations which may be affected include Ingham, Cardwell, Tully, Wujal Wujal, Daintree Village, Abergowrie and Lucinda. The next warning is due to be issued by 1:25 pm. 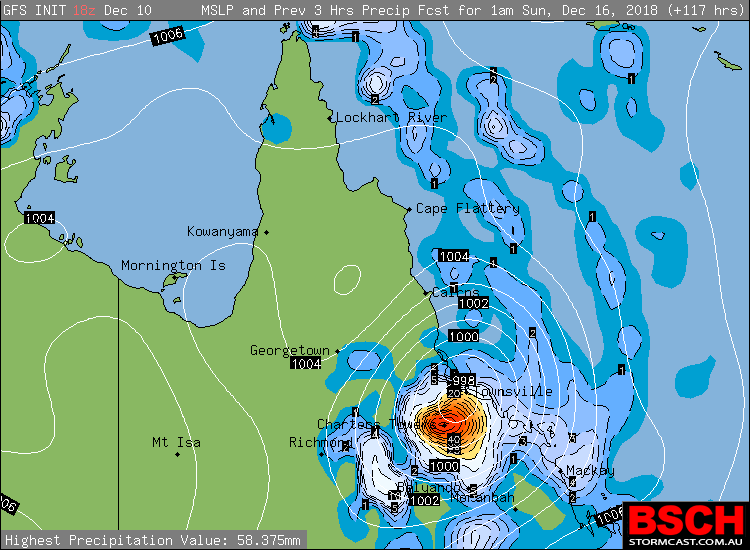 Have you ever seen TSV forecast (by BOM) for 120-200mm?! Cmon everyone - lets get excited! Is going to be a qild weekend in the north! Must be a typo, I'm sure they meant 10-20mm. Have a look at this rainfalls map. It's looks great for us. More rain, another night of Nosh? Nah just wishful thinking. another 21mm on last 2 days so December numbers are creeping up. Youngest daughter has a Nursing Ball on Saturday. I told her to buy a pair of gumboots as its at Rydges at South Townsville. No chance of a Noah, the Low will be moving too quickly. 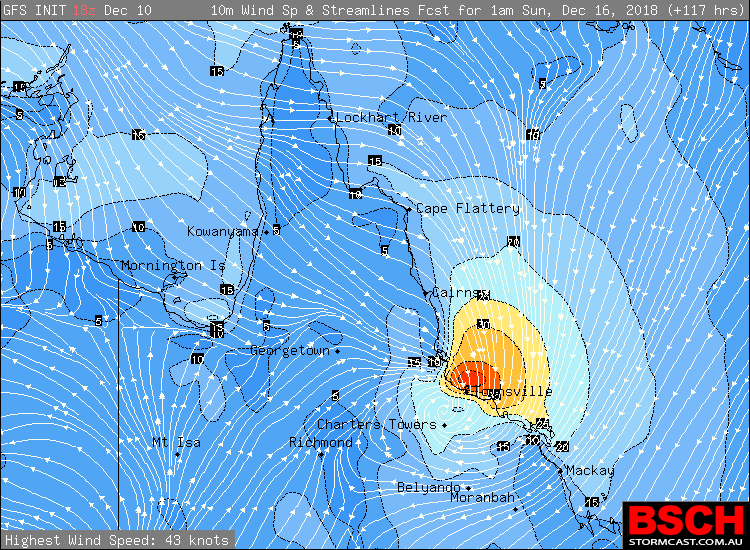 Meteye is forecasting some strong winds for Townsville on Saturday night (70+km/h). This Flood Watch provides early advice of possible flooding within the specified catchments. River level rises are likely across the Flood Watch area this week and into the weekend. Heavy rainfall associated with Tropical Cyclone Owen is expected across the Cape York Peninsula and Gulf coast for at least the next 24 to 48 hours, extending to the North Tropical Coast from Friday evening and through the weekend as the cyclone tracks southeast. Significant rainfall has been recorded across the Flood Watch area over the last three days. River rises are expected in response to the forecast rain, with the possibility of minor flooding developing in the flood watch area. The situation will be closely monitored and Flood Warnings will be issued if required. Heavy rainfall may also lead to local flooding. A Flood Warning is current for the Murray River. The next Flood Watch will be issued by 01:00 pm EST on Thursday 13 December 2018. Cloudy. Very high (90%) chance of rain. The chance of a thunderstorm. Heavy falls possible. Winds north to northeasterly 15 to 20 km/h tending east to northeasterly 30 to 45 km/h during the morning then shifting west to southwesterly 35 to 50 km/h during the afternoon. Damaging wind gusts to 120 km/h possible depending on movement and development of Tropical Cyclone Owen. Overnight temperatures falling to the low to mid 20s with daytime temperatures reaching the mid to high 20s. Look at all those rivers!!! Widespread flooding is likely across the Flood Watch area over the weekend and into next week, with moderate to major flooding possible in some areas. Heavy rainfall associated with Tropical Cyclone Owen is expected across the Cape York Peninsula and Gulf coast during Thursday and Friday. Rainfall will extend to the North Tropical Coast from Friday evening and extend southeast through coastal catchments over the weekend. Significant rainfall has been recorded across northern parts of the Flood Watch area over the last few days. The situation will be closely monitored and Flood Warnings issued when required. The next Flood Watch will be issued by 01:00 pm EST on Friday 14 December 2018. Those storms out west look like they're gonna spoil the Christmas Fair in Charters Towers. May even make it to Townsville! For people in Herbert and Lower Burdekin and parts of North Tropical Coast and Tablelands, Northern Goldfields and Upper Flinders, North West, Maranoa and Warrego and Darling Downs and Granite Belt Forecast Districts. Issued at 5:11 pm Thursday, 13 December 2018. Severe storms heading towards Townsville, through the southern inland and in parts of the North West. Severe thunderstorms are likely to produce damaging winds, heavy rainfall that may lead to flash flooding and large hailstones over the next several hours in parts of the Maranoa and Warrego and Darling Downs and Granite Belt districts. Locations which may be affected include Goondiwindi, Inglewood, Miles and Tara. Severe thunderstorms are likely to produce damaging winds and heavy rainfall that may lead to flash flooding over the next several hours in the Herbert and Lower Burdekin and parts of the North Tropical Coast and Tablelands, Northern Goldfields and Upper Flinders and North West districts. Locations which may be affected include Charters Towers, Townsville, Ingham and Clare. Severe thunderstorms are likely to produce damaging winds over the next several hours in parts of the Maranoa and Warrego district. Locations which may be affected include Hebel. Severe thunderstorms are no longer occurring in the Central Highlands and Coalfields district and the warning for this district is CANCELLED. 72km/hr wind gust at St George at 2:30pm. The next warning is due to be issued by 8:15 pm. Christmas Fair cancelled. Can't say the rain was super heavy but there was a lot of lightning and thunder and wind. Was watching that line of storms approaching from your west,- looked very impressive but now starting to break up a bit. A very common occurrence here in Cns, where the escarpment chomps them up before they get here. Just under 7mm in 4 minutes at Townsville AP, wind gust to 63km/h. Between 6:36pm and 6:47pm the rainfall rate at Townsville AP averaged approx 50mm/h. Not too bad. Its a tad wettish. Weather station recorded 18.1mm in 8 minutes, meh. Waiting for it to blow over and have a look at my Nylex. Auto weather station is horrible at recording rainfall and under reports on just about every event. modelling is not great for us. likely that Owen could be too far east and out into the coral sea now. That far east will give us sfa. Will just have to wait and see what happens now I guess Mick. At least we should see some good storm activity over the next couple of days. For people in North Tropical Coast and Tablelands and parts of Peninsula, Northern Goldfields and Upper Flinders and Herbert and Lower Burdekin Forecast Districts. Issued at 4:53 pm Friday, 14 December 2018. Severe Tropical Cyclone Owen will move into the tropical interior on Saturday with heavy rainfall and damaging winds developing. Severe Tropical Cyclone Owen lies over the central Gulf of Carpentaria approximately 190km north of Mornington Island. Tropical Cyclone Owen is expected to continue moving in a easterly track and is forecast to cross the southeast Gulf coast Saturday morning as a category 4 system. The tropical cyclone will move inland and transition into an ex-tropical cyclone by Saturday afternoon. Damaging winds and heavy rainfall are likely to develop in the warning area during Saturday afternoon and evening. The most significant impacts are likely with the passage of the low, however there remains some uncertainty with the movement and strength of the system. Note a tropical cyclone warning or watch is current for central and western parts of Cape York Peninsula. Heavy rain, which may lead to flash flooding, is expected to develop within the warning area tomorrow. 6 hour totals of between 100-200mm are possible with locally higher falls in thunderstorms and in vicinity of the ex-tropical cyclone. Damaging winds, with peak gusts in excess of 90km/h, are likely to develop near the ex-tropical cyclone in the tropical interior during Saturday morning or afternoon, and possibly develop in the North Tropical Coast and Tablelands, and northern Herbert and Lower Burdekin, during Saturday afternoon or evening. Locations which may be affected include Cairns, Innisfail, Tully, Chillagoe, Port Douglas, Cardwell and Mareeba. Tsv is going to get bugger all, will cross to our north so showery on sunday but low will continue to head east and give all the good juice to the NTC yet again, same areas that did well from it last weekend. Yup seems that way Mick. Maybe Townsville will see something if he approaches the coast again as forecast? Issued at 4:17 am Saturday, 15 December 2018. Tropical Cyclone Owen will move east over the northern interior today with heavy rainfall and damaging winds developing. Tropical Cyclone Owen crossed the southeast Gulf of Carpentaria coast between Kowanyama and Gilbert River Mouth in the early hours of today. Tropical Cyclone Owen is expected to continue moving east southeastwards over the northern interior of Queensland through today while gradually transitioning to a tropical low. Heavy rainfall, which may lead to flash flooding, is expected to develop over the warning area through this afternoon and evening. 6 hour totals of between 100-200mm are possible, particularly with thunderstorms. The heavy rainfall may persist into Sunday, particularly about the coast, as the system moves further east or southeast towards the Coral Sea. Damaging winds, with peak gusts in excess of 90km/h, are likely near the system as it moves east over the northern interior during today, and may extend to the North Tropical Coast and Tablelands district through this afternoon and evening. There is some possibility the low will move offshore of the east tropical coast during Sunday. At this point the system is deemed to have a low to moderate chance of reforming off the east tropical coast during Sunday or Monday. The situation will be monitored carefully and tropical cyclone advisories issued if the risk increases. Note a tropical cyclone warning remains current for the northern Gulf Country and southern parts of the Peninsula district. Locations which may be affected include Chillagoe, Port Douglas, Cairns, Mareeba, Innisfail, Tully, Cardwell, Ingham, Palm Island and Townsville. The next Severe Weather Warning will be issued by 11:00 am AEST Saturday. Yup, looks like Owen took quite a sharp (and unexpected) SE turn overnight. Hopefully he'll commence a more ESE track as the day goes on. Despite this, some models (such as GFS) aren't showing any significant rainfall for the NTC or Herbie Burdie from this system. Light showers just kicking in at Nelly Bay this morning. Issued at 10:31 am Saturday, 15 December 2018. Damaging wind gusts will also be possible about the northern beaches of Cairns during Sunday morning. The next Severe Weather Warning will be issued by 5:00 pm AEST Saturday. 32mm to 0900 Friday morning December totals are looking good. Cyclone prep all done (I made the bed). Quick yard check and gutter check and fed all the animals. Hopefully we will see some decent rain tonight, maybe some thunder and more than a love puff of wind. Flooding is likely across parts of the Flood Watch area during the weekend and into next week. As Tropical Cyclone Owen crosses the Cape York, heavy rainfall is expected to develop over the North Tropical Coast from late Saturday and extend southeast through coastal catchments over the weekend. Recent rainfall across the Flood Watch area has primed some catchments ahead of the expected rainfall. Minor flooding is likely across parts of the Flood Watch area, with moderate to major flooding possible in catchments that receive the heaviest rainfall. Flooding is no longer expected in the Gulf Rivers catchments, with recent heavy rainfall small rises are possible into next week. 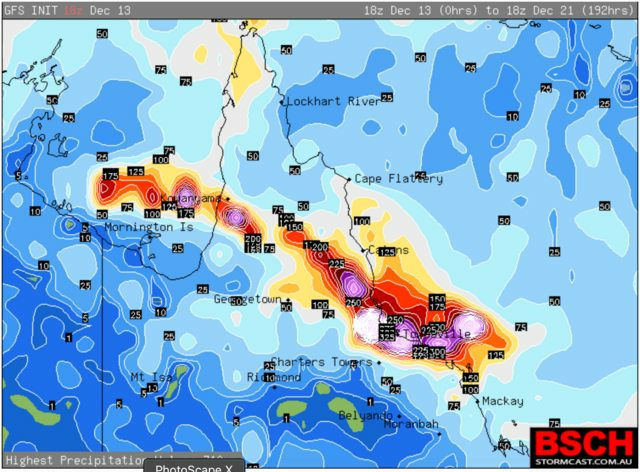 With changes to the forecast cyclone track, flooding is no longer expected in the Belyando and Suttor Rivers and catchments south of St Lawrence to Rainbow Beach. The next Flood Watch will be issued by 01:00 pm EST on Sunday 16 December 2018. Just had a healthy 30+mm here at Forrest Beach. Just got back from Bilyana, was VERY wet South of Ingham. Lovely steady rain!! Should be a very wet night. For people in North Tropical Coast and Tablelands and parts of Peninsula, Gulf Country, Northern Goldfields and Upper Flinders and Herbert and Lower Burdekin Forecast Districts. Issued at 4:57 pm Saturday, 15 December 2018. Ex-Tropical Cyclone Owen to produce heavy rainfall and damaging winds over the northeast tropical coast. Tropical cyclone Owen crossed the southeast Gulf of Carpentaria coast between Kowanyama and the Gilbert River Mouth as a low-end Category 3 system at approximately 3am AEST this morning. Since then, the system has gradually weakened over the northern interior and has now officially been downgraded to a tropical low. The system is forecast to continue tracking towards the northeast tropical coast overnight tonight and into Sunday. Heavy rainfall, which may lead to flash flooding, is expected to develop over the warning area overnight tonight and into Sunday. 6 hourly rainfall totals between 100-200mm are possible, particularly with thunderstorms. Damaging wind gusts in excess of 90km/h are also possible near the system as it moves towards the North Tropical Coast and Tablelands district overnight tonight and into Sunday. Damaging wind gusts will also be possible near the base of the coastal ranges, including the Cairns area during Sunday morning. It's possible that the tropical low will move off the northeast tropical coast during Sunday. It currently deemed to have a low to very low chance of reforming into a tropical cyclone during Sunday or Monday. The situation will be monitored carefully and warnings and advisories will be issued if necessary. Locations which may be affected include Townsville, Cairns, Chillagoe, Port Douglas, Mareeba, Innisfail, Tully, Cardwell, Ingham and Palm Island. Townsville couldn't have asked for much better than this tonight. Solid concentration of rain centered right over the city. The original BOM forecast from a few days ago of 120-200ml might turn out to be right by morning. Forum seems a bit quiet these days though? Expect a bit more chatter for rain like this. Massive rainfall up my way. I drove back from cairns to Ingham early tonight. Water on the road everywhere between Cardwell and Ingham. 5 mile creek was over the road. When I got to the Seymour it was also full, and several other spots between there and Ingham had plenty of surface water. Ingham itself had many streets under. Spoke to someone in Halifax and they are swamped. I've never seen a situation before where an area that's under severe weather warning also ends up with a severe thunderstorm warning. Flood warning also issued for the Herbert. 378mm for Halifax in 6hours in last ewn alert. Bluewater 150mm since 9am, most of townsvillle around 90mm sure to break 100 or more by the morning. about friggin time North QLD copped it instead of North WA. Let's hope it continues further into the wet season. Halifax approaching 600mm now. secondary low formed over Ingham and has sat stationary all night, Halifax getting the brunt of it. Low now starting to move ENE out to sea by the looks. models had it moving SE so they got that wrong. Bruce highway is cut north of Ingham, possibly south soon too. Issued at 3:54 am Sunday, 16 December 2018. 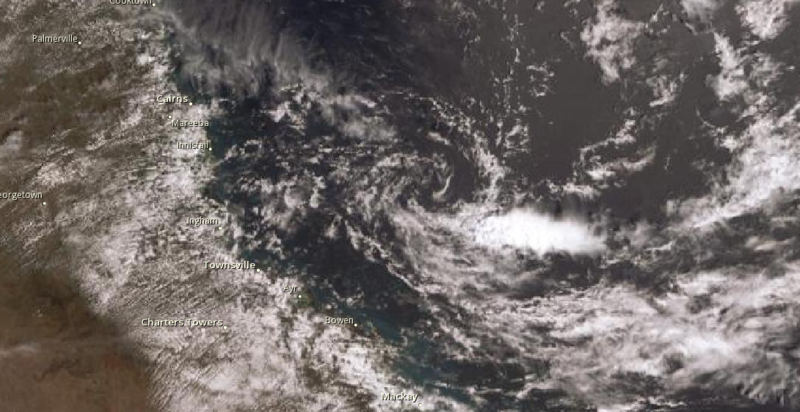 Ex-tropical cyclone Owen moving off the North Tropical Coast, producing severe thunderstorms in the area. Severe thunderstorms are likely to produce heavy rainfall that may lead to flash flooding and damaging winds in the warning area over the next several hours. Locations which may be affected include Townsville, Palm Island, Ingham, Rollingstone and Lucinda. Halifax, east of Ingham, has recorded 314mm of rainfall during the past 6 hours, and 578mm since 9am Saturday. 100 km/h wind gust recorded at Lucinda at 3:30am. The next warning is due to be issued by 6:55 am. What's the 24 hr record? Surely must be pushing it, 588mm now with few hours left. Not sure on that record for that aws. will have to try and find out. enjoy the last few hours of rain folks, once that low gets to far east in a few hours time its all going to clear up. god knows when we will get a decent event again. How long has it been since tvl last had a good drop like this. Yup BIG T, has been awesome listening to the rain all night. Much needed. we had a good drop back in late Feb, early March but this is the best December we have had since 2011. Crazy totals for Halifax! Wow! Great to see some decent rainfall in Townsville also. Hopefully the dam is getting some good inflow. Ingham is for the first time that I can recall isolated from local water! Even the new highway to the south at Francis creek is closed, and a number of dead cows are up agains the Francis creek bridge. Last night there was significant local flooding and strong winds that kicked in around 1.30am. Luckily, the heavy rains fell at the lower end of the catchment - otherwise we'd be in for one hell of a flood if those falls fell inland around and upstream from Abergowrie. Regarding rainfall records, Ingham exisiting record is 488mm in 6 hrs. I think Halifax will now take the crown for the district! It's beautiful Hanksy, cool and a bit breezy with moderate rain. Very dark for this time of the morning as well. But in real life there should be a lot of inflows over the next few days that will push it over. Went to bed around midnight last nigh and had recorded 85mm since 0900 Friday. Just checked and there is another 51mm in there. so 131mm for this event, so far. Models are hinting that it could be a wet Xmas/NY period. 166mm to 9am in BG. 9 more night before Santa come to town. I like to know what the weather will be like over Christmas? 135mm in downtown Kirwan, best December total since 2010 and just crept over the yearly average. Just 5mm on sunday. Still haven't cracked 1000mm yet. At least the place is green. A substantial DP of 27.0 at Townsville AP at 1600. Lucinda with 500mm has its second wettest day on record, behind 16 March 1893 with 563mm. Macknade Mill - 3rd highest on record with 571mm, behind 592mm on 6 January 1901, and 593mm on 7 December 1964.
well the SE change has moved thru this evening. Total disappointment to not get any storms or rain with the change. looked very unstable at lunch with cells popping up galore but all inland and too far south for us. Some drizzly showers overnight and morning and then we watch the NTC get smashed by ex Owen and Coral Sea troughs for the next week. Merry Christmas everyone. Hope you all have a wonderful day. Merry Christmas to you as well Mick, and everyone who frequents Weatherzone. Possibility of a new cyclone forming on 30th December would be a great way to end the year and start the new one. Had a house full for Xmas. whole family home for a change. A couple of small showers over the last few days but barely enough to register as a trace. Silly weather today. periods of bright sunshine followed by a minute or two of very large rain drops and then back to bright sunshine again. Already prepped from the last non event cyclone. Just need to put away the chairs and BBQ tables etc. OK I want a cyclone, that crosses as a Cat 2 during daylight hours. Nitso and Trav get on to it guys. 2018 Yearly rainfall stats for Kirwan, averages in bracket. First time since 2012 I have recorded above the long term average, only just. While the airport recording station was just slightly below the average. 1198mm in BG. Wettest month was December (338mm), followed by Feb (284mm). Hopefully 2019 will be a record year for all the right reasons! Meh I didn't get my average in 2018. But then it was very patchy every where. 28 hours and no posts. For our busiest time of the year it sure is dead in here. 3 x potential cyclones and nothing will come with in a bulls roar of us. Models all over the shop like a mad woman's knitting, meh models. Locals are not interested, people losing their collective minds on sunshine coast, again. thats cause everyone has moved onto the January thread SBT!! Generated in 0.075 seconds in which 0.009 seconds were spent on a total of 13 queries. Zlib compression disabled.